Last Thursday and Friday I attended the Irish Learning Technology Association (ILTA) EdTech 2010 Conference in Athlone IT. 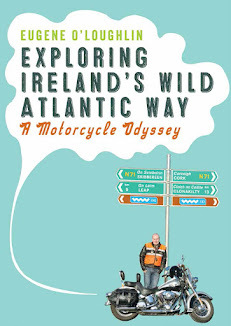 I rode down on my Harley in 70 minutes and very much enjoyed the motorway which now extends all the way to Galway. Not since Britain and France in 2008 have I had such a long spin on a motorway. A cool way for me to start EdTech. I was very impressed by the organization of the Conference - congrats to Nuala H and the EdTech team for an excellent event. First up was the first Keynote presentation by James Clay of Gloucestershire College who both entertained and informed us about the Changing Culture of the use of technology in education. While he regularly referred to technology as "Oooo, shiny things", he got the Conference off to a great start with his mix of personal anecdotes and descriptions of his initiatives in Gloucestershire College. During the break that followed I attended the Exhibitors Hall and was very impressed by the technology on display. After the break I attended a talk by Ioana Ghergulescu (of NCI) on MoGAME: Motivation based Game Level Adaptation Mechanism, which proposes to combine motivation assessment and learner knowledge in order to personalize game difficulty level for learners. After this I attended a talk on Supporting Informal Learning by Anita Flanagan of Google. I continue to be amazed at what Google are doing and Anita showed us some wonderful tools for promoting informal learning within Google - watch out for more from Anita and her colleagues. Unfortunately the third of the three sessions I planned to attend was cancelled as the presenter had a puncture to deal with and could not make it. The last session before lunch was a Pecha Kucha style presentation (20 slides, 20 secs each). I have mixed feelings about this style. It was very fast and some presenters (most notably Catherine Kane of Trinity) did a good job in keeping the "flow" going. However, I must admit that I was concentrating as much on the technique and the presenter's ability to deal with it, as with the content of the presentations. I'm glad I was able to persuade the organizers that my own presentation did not suit the PK model. Well done to all! After lunch I attended a talk by Dave Madden (a good friend and former colleague in CBT Systems) who presented on the use of Multiple Intelligences. I never got all this MI stuff, but Dave gave an interesting talk on a model for MI. Still not sure if I understand what MI is about. The next talk was by Mary Dempsey of NUIG - she asked me to embed a video (not a YouTube one) for her into her presentation beforehand, which unfortunately did not work (sound was OK, but no picture - apologies Mary). This was an interesting talk on the successful use of Wiki technology as a teaching enhancement tool in the classroom. The Conference proceedings for the day ended with a keynote address by Jane Hart of the Centre for Learning and Performance Technologies (C4LPT). Jane gave us an excellent exhibition on the use of Twitter as a collaborative tool in education. She has many of us tweeting responses to her questions, which she showed on screen. Excellent and inspiring stuff. A key part of EdTech is the social element to the proceedings. We had dinner in The Olive Grove restaurant overlooking the Shannon river. It was great to catch up with ILTA at the dinner. I shot a (poor quality) short video with my iPhone of the dinner which can be viewed on Qik.com here. A great evening was had by all - a pity about the rain that arrived later. On Friday, the day kicked off with Elliott Masie delivering the third keynote - first via recorded video, and secondly by Skype video phone. Elliott as fascinating as he talked about video and learning. Interesting ideas about video dissertations and having teachers look at themselves on video to improve their own performance. Elliott is also a natural at presenting - he was sitting in his office in New York at 6.00am talking to us via Skype. Next up for me was a presentation by Rose Baker of Penn State - this was also delivered remotely as Rose was a victim of the Icelandic ash cloud. Her talk was an interesting mix of scaffolding to support learning which is provided in "chunks". Despite technical problems, I really enjoyed her talk. Twitter played an interesting role in the Conference. Apart from the use by Jane Hart, there was a lot of tweet traffic throughout each presentation - it seemed natural to tweet while listening to a presentation at the same time. I used my iPhone and TweetDeck, which allowed me to keep up-to-date with comments from the many fellow twits at the conference - a great way to share the experience. Overall, EdTech is a special conference for me that I love going to. Congratulations to ILTA for putting on a well run event.